Black Friday! We’re Having a Sale on Uncanny Adventures! After a wonderful Thanksgiving here at the 8th Wonder Press orbital satellite, and stuffed full of good turkey and good wine, we’ve decided to spread the warm feelings around. Only for tomorrow, November 29th, we’ve made Uncanny Adventures available for only $9.99! That’s almost 25% off cover price! Because we believe in our book so much and we know you’ll love reading 170 pages (!!!) of terrific comics as much as we do, we’re joining in on the biggest shopping day of the year and giving you the chance to sample our latest book for under 10 bucks, clams, simoleons, or smackaroos! And you don’t even have to leave the comfort of your couch to get it delivered to your door! 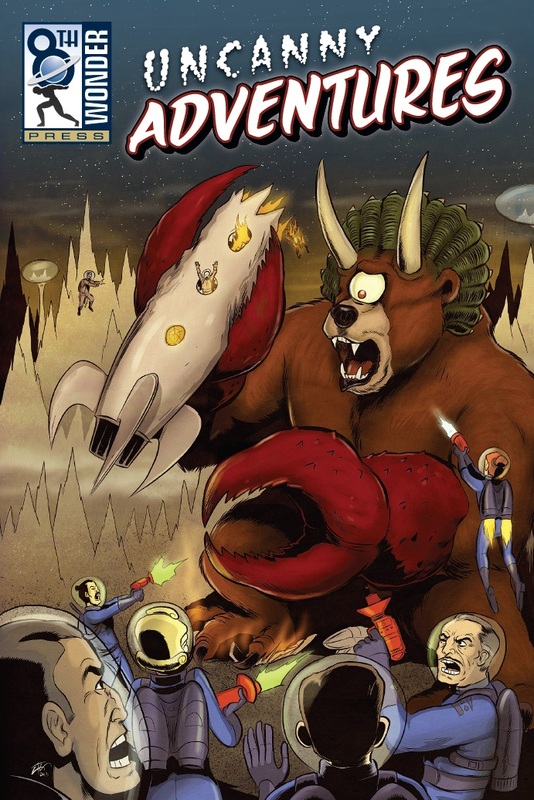 With all-new cover art by Axe Cop’s Ethan Nicolle, Uncanny Adventures is stuffed full of amazing comics you’ve never seen anywhere else. Submissions Period is Ending Soon! It’s been a while since we’ve checked in, but the submissions for 2014’s SCIENCE/MAD SCIENCE anthology have been pouring in, and they’re outstanding! When the finished book comes out you’ll see new work from previous contributors Jay Sternitzky and Mateo Cantu, Mister V, and Whit Taylor, as well as some terrific new talent. The level of skill and quality in this year’s book will blow the last one away (and UNCANNY ADVENTURES is amazing)! The submission period ends at midnight on the 30th (that’s THIS Saturday! ), but the good news is there’s still time to get yours in. Just read up on all the details at https://8thwonderpress.com/2014-anthology-science-mad-science/ and then email your pitch in pdf format to submissions@8thWonderPress.com. For those of you in the United States, we wish you the happiest of Thanksgivings. And to ALL of you, good luck with your submissions!